anchor and ensure that the book is really available? Fortunately, I have my own personal copy dating from 1978! the debugged version does. The new version should be available later today. The link should take you to the very end of this web page: http://www.softwarepreservation.org/projects/ALGOL/standards/ (scroll down to the end if necessary). There you should find links to the full book, the table of contents, and the syntax charts. The listings for Algol68RS are on this page: http://www.softwarepreservation.org/projects/ALGOL/algol68impl/ (you’ll have to scroll — I didn’t add anchors for the various implementations). 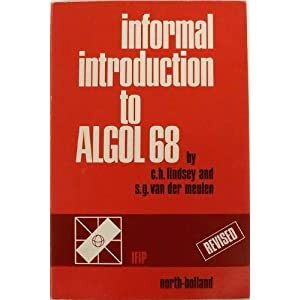 There I provide links to an ELLA release at NYU and a Linux port of algol68toC by Dr. Sian Leitch. Is that by any chance you? that my father was Lord Louis Mountbatten. It’s worth pointing out that the language in the Algol 68 Report and the one in the Revised Report are not the same. The original (green cover) Informal Introduction goes with the original Report; the edition you have here (red cover) describes the language of the Revised report. Section 0.3 in the Revised Report describes the changes made between the two editions of Algol 68. There are some differences in how the language is described as well; RR section 0.4 spells those out.